Salima is the Director of Development for Build Toronto, an innovative real estate development corporation created as part of the City of Toronto’s strategy to enhance Toronto’s economic competitiveness. Her previous professional experience ranges from managing property developments for SmartCentres, structuring venture capital deals for Care Enterprise Partners, to producing some of Toronto’s most successful cultural arts festivals notably the Hot and Spicy Food Festival and Masala! Mehndi! Masti! Outside of work Salima is engaged in community. 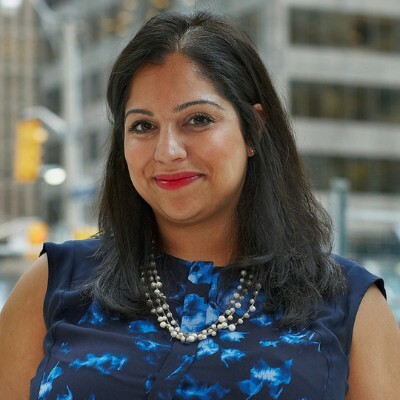 She is a past Co-Chair of the Emerging Leaders Network; was instrumental to the establishment of TORONTO+acumen in 2010, where she continues as an advisor; and, she chair’s the investment committee for RISE Asset Development, a micro fund dedicated to financing entrepreneurs living with mental illness and addictions. Salima holds an MBA from the Rotman School of Management at the University of Toronto, as well as a Bachelors of Commerce from the Sauder Business School at the University of British Columbia, where she was elected Valedictorian of her graduating class.